3 Bedroom Detached Bungalow For Sale in Leicester for Offers in excess of £310,000. 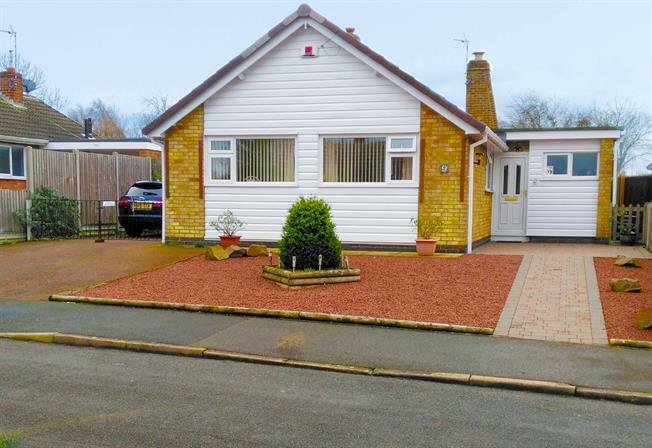 This well presented and spacious three bedroom detached bungalow is situated on a cul-de-sac within the highly desirable location of Oadby, and would be ideal for anyone looking to downsize. Internal viewing is highly recommended. Upvc door leading to driveway, door leading to hall. Leading to lounge and cloak room. Carpeted flooring, ceiling lights, radiators. Remote controlled gas fire, doors leading to conservatory and kitchen. Spacious Farm house style kitchen with stylish wall and base units. Sink and drainer with mixer tap over, integrated oven and hob, integrated fridge and freezer, plumbing for washing machine, complimentary tiling throughout. Carpeted flooring and ceiling lights, fitted wardrobes and upvc double glazed window to the front aspect. Fitted Wardrobes and carpeted flooring with ceiling lights and radiator. Upvc Double glazed window to the front aspect. Upvc Window to the side aspect, ceiling lights and fitted wardrobe space. Shower Unit, low level WC and wash basin. Sliding doors to the living room and french doors to the rear garden. Self cleaning glass roof and remote windows. The property boasts a well stocked landscaped rear garden which is easy to maintain, quality artificial lawn area, patio, water feature, shed, fenced borders, a range of mature shrubs, plants and trees. Side gated access leads to front garden being landscaped providing easy maintenance and ample off road parking.